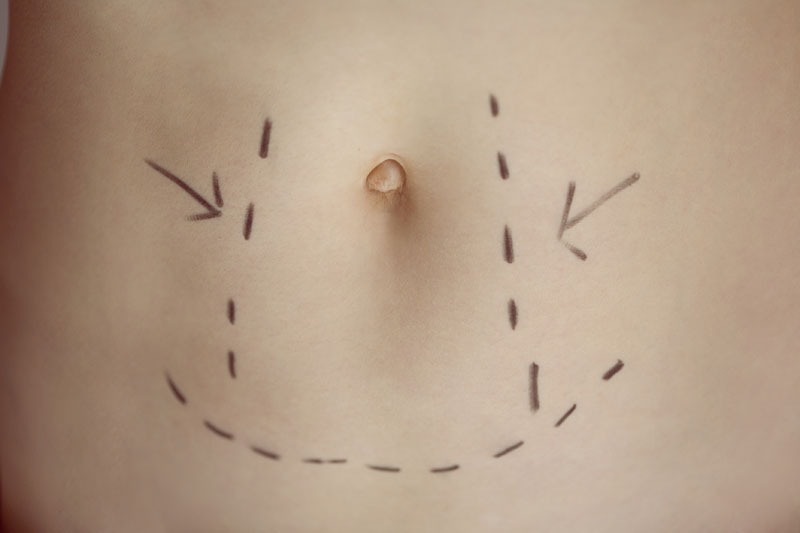 During endoscopically-assisted abdominoplasty, underlying abdominal muscles are tightened without the need for removing excessive amounts of fat or skin. The procedure is made by making several small incisions across the abdomen and then inserting small instruments to separate skin from muscle. Endoscopically-assisted abdominoplasty may be utilized in cases of excessive muscle stretching that occurs due to multiple pregnancies. There are no comparable non-surgical alternatives to endoscopically-assisted abdominoplasty. Surgical alternatives include miniabdominiplasty, high lateral-tension abdominoplasty, fleur-de-lis abdominoplasty and traditional abdominoplasty. Endoscopically-assisted abdominoplasty is performed under general anesthesia, which means that the patient is asleep and completely unaware during the procedure. Possible risks following endoscopically-assisted abdominoplasty include infection, bleeding, swelling, bruising, scarring and a negative reaction to the anesthesia. It is also possible to experience fluid accumulation under the skin and a reduced blood supply, leading to necrosis. The prognosis for a positive end result following endoscopically-assisted abdominoplasty is good. Total recovery from endoscopically-assisted abdominoplasty takes four to six weeks.